The first time Mark Ronson met Duran Duran, he would've loved to work with them — the only problem was that he was just a kid. "I was way into them," says Ronson, 35, whose mother was friends with the band. "I found out that [bassist] John Taylor was going to come by our house and I freaked out — I kept making excuses so I could stay up past my bedtime to meet him." Fast-forward a couple of decades, and Ronson's childhood dreams are coming true: He produced Duran Duran's new LP, All You Need Is Now, which was released on iTunes in December (a CD with more material will be out in February). "I felt like I was just a mouthpiece for 10 million Duran Duran fans who know just what they want them to sound like," says Ronson. All You Need Is Now brings back the New Wave keys and driving bass lines of the peak Rio years. "That's a certain sound that Duran Duran really own," says Ronson, "and don't get a lot of credit for." It will be a major relief for fans bummed by 2007's beat-heavy Red Carpet Massacre, a poorly received record produced by Justin Timberlake and Timbaland. "On that album, we were guitarless," says Taylor. "We really needed that. Duran Duran is a delicate ecosystem. We are synth-pop, with guitars." Ronson and the band went into the studio in the spring of 2009 to see how the collaboration would work. "Ronson would never be just a passive observer," says Taylor. "He'd be banging a cowbell or playing guitar. He made us feel very special, like we still had something to say." The first single is the clanging title track, marked by a seesawing synth riff and a chorus that works as a mission statement for the LP: "You sway in the moon, the way you did when you were younger/When we told everybody, 'All you need is now.' " Says Le Bon, "It's a message, really, from the band to our fans, saying, 'Keep the flame burning.' "
The Scissor Sisters' Ana Matronic sings on the Talking Heads-style disco cut "Safe (In the Heat of the Moment)"; Kelis coos backup on the electro-pop tune "The Man Who Stole a Leopard," inspired by the 1965 Terence Stamp horror film The Collector; and Arcade Fire collaborator Owen Pallett contributed string arrangements. "It's full of great words and beats," says Le Bon of the LP. "It will get you up and dancing and make you want to take your clothes off." 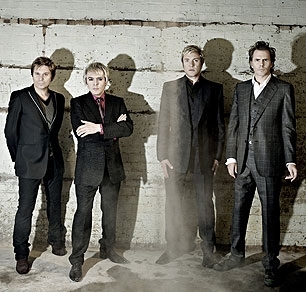 Duran Duran are planning to tour the world in 2011, including some special shows in the U.S., where they'll play the new LP front-to-back. "Writing and recording a new album is the most challenging part of the job," says Taylor. "Now we can relax and plan our year on the road."